This ornithopter kit is just one of several available for purcahse at birdkit.com. March typically is the month to head out to the park with a kite and make the best of windy weather. But what if the addition of a rubber band (and admittedly a decent amount of math and crafting) could make that kite really take off? 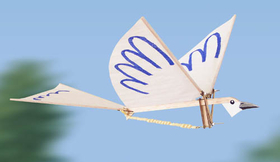 This isn't a kite, per se, but an ornithopter, a type of aircraft that flies by flapping its wings like a bird. Youtuber RimstarOrg uses supplies from his local hobby store to build the body of the ornithopter, with a good deal of balsa, wood glue and cotton thread, plus a few paper clips to build the motor. His measurements are precise, and he provides notes for each of the parts, as well why he chooses to use heavier equipment in certain important places. Engineers will appreciate that he actually breaks out a protractor to get exact angles for those paper clip hooks. It's also worthwhile to note that he lets the parts dry while propped up on some well-used textbooks, which is no surprise with his level of detail. With all things done, his ornithopter weighs in at just 0.25 ounces. The blog's rule so far has been to use just household rubber bands, but given that shorter rubber bands will mean shorter flights, it's worth forgoing in this instance. RimstarOrg uses a 1/8 inch tan wide super sport rubber tripled up, wound up for about 200 turns. With the all-clear, he launches the ornithopter for a short burst of nearly bird-like flight. While his flight lasted for about 20 seconds, it's by no means the longest for hobbyist ornithopter constructors. According to The Ornithopter Zone, the website of the Ornithopter Society, the current record for an long-distance rubber-powered ornithopter is an astounding 21:44, set by Roy White in 1995.